I wish I had discovered the Rubbermaid® Max Add-On™ Closet Helper System before we put in a permanent organizing unit into all of our closets. I am not happy with our current closet organizers but since we had to attach everything directly to the wall with hardware we are now stuck unless we do an entire remodeling. 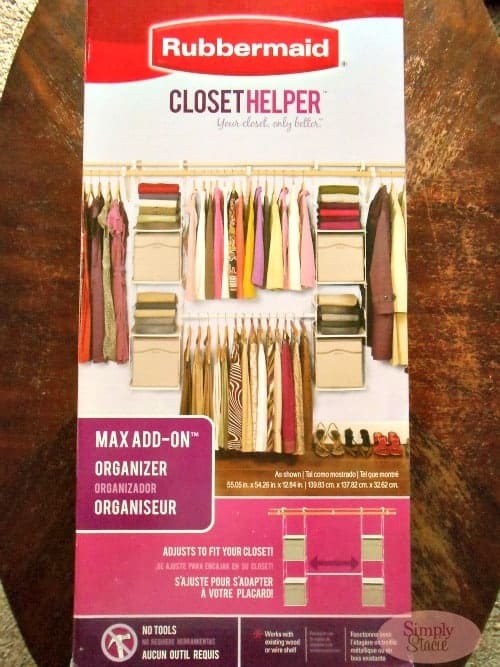 Our closet structure has been damaged by the other brand organizer and I would highly recommend that anyone wanting to use a closet organizing system purchase the Rubbermaid® Max Add-On™ Closet Helper System instead and avoid this problem all together. The Rubbermaid® Max Add-On™ Closet Helper System is an excellent organizing solution because it allows you to simply add extra shelving to your closet without having to tear out the original shelving….simply add to what you have and it will be “Your closet, only better” ™. The Closet Helper System is a comprehensive organizer that adjusts to fit any closet and works with the existing wood or wire shelf. You will not need hardware or tools so it is very simple to put it together. This set includes a durable metal frame, sturdy plastic shelves, a telescoping hanging rod that expands from 2-3.5 feet and four fabric cubbies. One neat feature is that the shelves can be adjusted up and down with the easy to use hand levers. I would never use anything else except the Rubbermaid® Max Add-On™ Closet Helper System to organize my closets again because it is far superior to the current organizing systems that I have installed in my closets. I have set up the Max Add-On™ Closet Helper System in our foyer closet to organize our games, coats etc. It was so easy to set up and it has really given us a lot of free space to keep everything organized. I also like that I can have the kids games, toys lowered from the top shelf where they could not reach it to a lower level in the fabric cubbies so they can get what they need and put it all away without asking for my help. You are invited to visit Rubbermaid® to learn more about the Max Add-On™ Closet Helper System and browse the entire selection of organizing products for your home. I really like the Closet Helper Shelf and Hang Unit! I like the wheeled under the bed box. Perfect for storing out of season clothes! I could use the fast track adjustable closet set for my pantry. OH my goodness do I need this, I am moving to a space with a lot less closet space than I did have. I may just have to buy a few when I get there. The closet helper drawer cube also sounds great! I would love to have the Filter Fresh Water Bottle. The All Access Organizers because you can see what you’ve put into them. 75 Qt DuraChill™ Wheeled 6-Day Cooler – we’re going camping in aug!!! Being in an apartment, I need to maximize the space without making any permanent changes. This system looks FABULOUS!! I’d love the All Access Organizers to store all the little stocking stuffers I have already gotten.